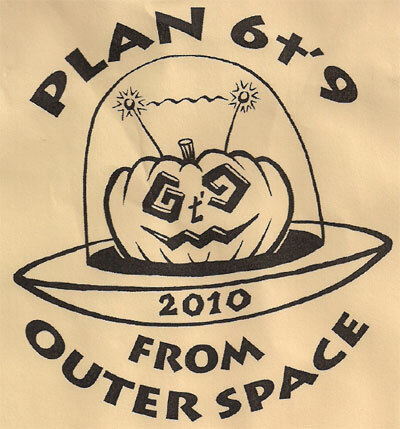 6 t'9 is a Social Aid & Pleasure Club dedicated to passing the fine art of parading down to the next generation, rebuilding the New Orleans community, and of course pleasure. in New Orleans please click here! The 6t’9 Social Aid & Pleasure Club is modeled on the Benevolent Societies that flourished in New Orleans in the 19th Century. These clubs originally formed so that people living in segregation and poverty could aid one another during times of crisis such as illness, job loss, or death. Parade Date: 2009 TBD, from 6 PM t' 9 PM. 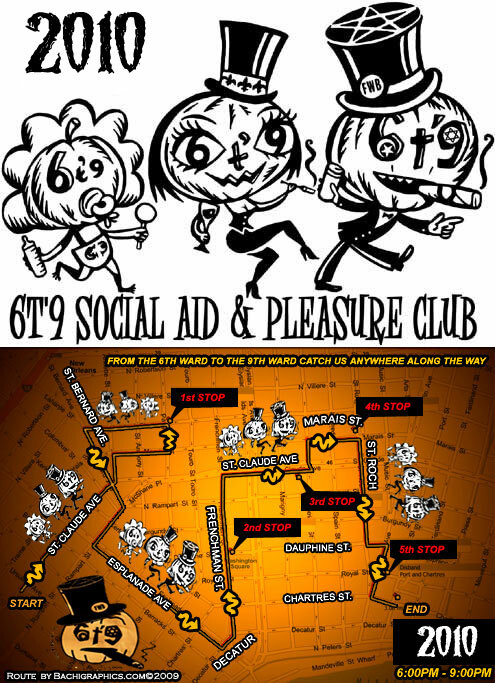 6t’9 Social Aid & Pleasure Club announces our first ever “Parade Bail-Out” Membership Party on Saturday, September 26 beginning at 9 PM at the All Ways Lounge (2240 St. Claude Avenue). Our annual parading dues are $69.00 for anyone who pays before the party ends. Family and Group Discounts are available as well! Entertainment provided Chrystal Skye with a special guest performance by Queen Katrina a.k.a. “The Snicker Switch.” Don’t miss it! 6t’9 Social Aid & Pleasure Club announce its Fifth Annual Halloween Parade, from the 6th Ward t’ the 9th War, on Saturday, October 24, 2009 from 6 PM t’ 9 PM. Membership is open to all and children are welcome. Visit us on at www.6-9SAPC.org or find us at www.myspace.com/6t9SAPC or on our Facebook group page. The 6t’9 Social Aid & Pleasure Club models itself after the traditional Benevolent Associations of New Orleans and celebrates in the creation of innovative parades. From our inception, we have engaged in social aid projects, including the first ever house gutting party in the Lower 9th Ward, assistance rebuilding the House of Dance and Feathers and donating school supplies for the Fi-Yi-Yi/Backstreet Cultural Museum Back to School Picnic. When two of our members were injured in a near fatal car crash we engaged in a fund raising campaign for them. It is central to our mission to help our membership in times of crisis. Our signature event is our Halloween Parade which always rolls the Saturday night before Halloween, and we have created an adults-only Valentine Parade. All funds are generated solely by membership dues, business sponsorships and donations. We also raise money for our activities at our annual KontraFlow Festival outside of Jazz Fest. Nope, and I still don't care.